Join us TONIGHT at Mass Ave Pub for some Barrel Aged Beers! 6PM is the start time. Flights will be available because MAP is awesome. 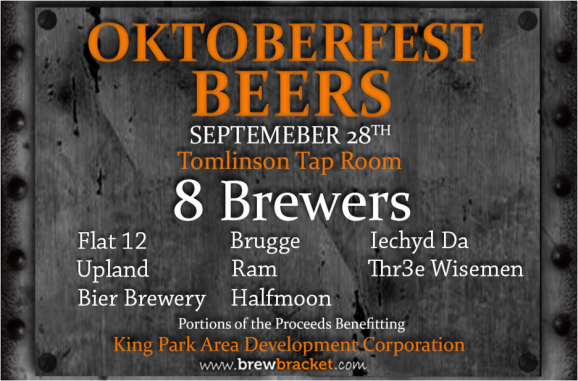 Broad Ripple Tavern Concert 9/27/2013 5-11pm 745 Broad Ripple Ave 4 Beers on Tap Indianapolis Cutter Sponsers the concert. Enjoy Circle City Beer Week and come see us tonight or Saturday. We are pouring all our beers. Daredevil Brewing Co night, La Margarita, Friday, July 19th. Lift Off IPA, Rip Cord Double IPA, Muse Belgian Golden Ale & Vacation Kolsch available. You can always find the full list of locations that carry Lift Off IPA and our limited release beers on our website. Also, you can keep up with the latest news and learn about new locations to find our beers first by following us on our Twitter and Facebook pages. Want to know what people are saying about our beers? Check out our profile on Untappd. And if you are looking for some Daredevil Brewing swag check out our online store. Muse Belgian Golden Ale: Enjoy it while it lasts as it's almost gone! A Belgian seasonal made in the Belgian Strong Ale style. Displays delicate Belgian perfume of pears and apples compliments complex spicy phenolics and lightly sweet alcohol with an inspiring clean, bright finish. More events, including next Thursday's MMF(Mystery Beer, Music & Food Trucks), a Flat 12 night at Twenty Tap and Flat 12 Night at Lino's in Speedway. Flat Jack Pumpkin brews; on the road - Great Taste of the Midwest. Join the RAM at the premier beer event in central Indiana. Thousands of guests sample hundreds of beers from dozens of breweries from around the country. Highlights on tap from your RAM will include Pacific Jade, Barrel-aged Final Countdown, and a Firkin of dry-hopped Buttface Amber. Introducing the party that follows the CCBW hangover. On Thursday the 25th at 7 at our Downtown location, we will tap a full range of barrel-aged beers that we have been aging including all of our barrel-aged versions of our RAMAGEDDON series and the grand release of Barrel-aged Oktoberfest. Enjoy! 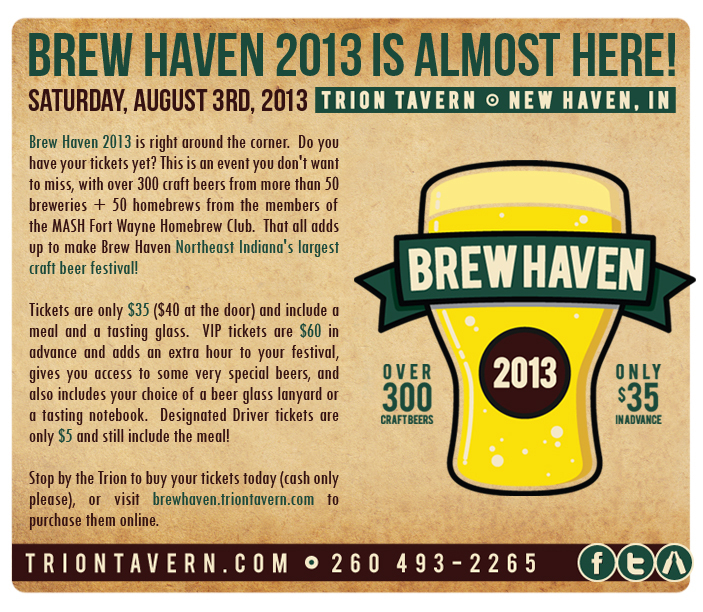 We are very excited to see everyone at the Indiana Microbrew Festival! We will have our Bulldog Brown, Two Lucys Blackberry Wheat, Rocky Ripple Pale Ale & Centennial Martyr Double IPA. Come by at 5pm & 6pm for our special tapings. Our list of great establishments pouring our beer keeps growing. Some of our newest locations are Puccini’s in Carmel and Dicky’s Wild Hare in Fort Wayne. You can find a full list of locations on our website. If you know of any events that you would like to see Thr3e Wise Men Beer at then let us know. 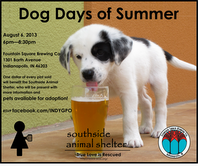 Tuesday, July 30, 6-8pm it’s Triton Tap Night Tuesday at Drake's Keystone (3740 E 82nd St Indianapolis, IN 46240)! Join us for the for a great time! Scotty’s Brewhouse Mishawaka is now serving Sun King Grapefruit Jungle!! Come get a pint any day till it’s gone for $7.00. 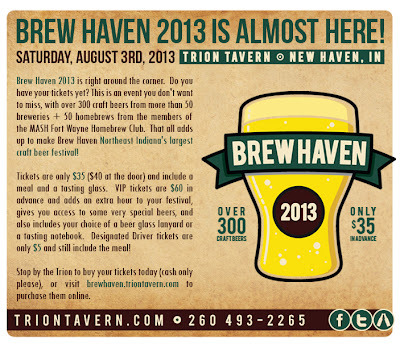 The Indiana Microbrewers Festival makes its 18th showing on July 20 in Broad Ripple. Your favorite Indiana breweries will be joined by a select group of guest breweries from around the country at Indiana’s largest craft beer event. Over 300 beer selections to choose from! This is a 21-and-over event. All guests must present valid, current photo ID at the gate. Follow the Indiana Brewers Guild on Facebook and Twitter for announcements! Thursday, July 25th from 6:00-8:00 pm drink some delicious mead and ciders, play a little game called Cards Against Humanity, and make new friends. This is a ladies only event and space is limited. A free ticket reserves your seat at a table to play Cards Against Humanity. Set your alarm clocks - tickets will become available Thursday, June 27th at 9:00 a.m. Get your ticket here! Event is sold out.